The FT1 friction tester is a perfect choice to easily measure static and kinetic coefficients of friction. 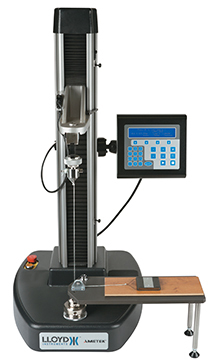 The FT1 is a bench mounted dedicated friction tester. A friction table is mounted directly on the machine and the friction tester comes with a full set of accessories for performance of friction tests conforming to the requirements of ASTM D1894, ISO 8295 and TAPPI T549. The FT1 friction tester includes these standards as user configurable tests with an additional seven tests available for user custom configuration. The console has a user interface dedicated to performing friction tests, and calculating static coefficient of friction, kinetic coefficient of friction, peak, and average load. The machine is a fully self-contained instrument, however an USB is provided to allow computer control using the NEXYGENPlus data analysis software if required. The friction tester has a large working area. The speed accuracy is +/-0.2% of selected speed from 2% to 100 of max. speed. Request more information to see how we can help you with a friction tester solution that suits your need. Find the Declaration of Conformity for the FT1 friction tester here.